Sarah Palin's book tour is underway, and she's hitting all the major spots -- Oprah, Barbara Walters, Hannity and The Factor. It's been more than a year since she and her running mate lost to the Obama/Plouffe/Axelrod public relations machine, yet she still finds herself front-and-center in the national spotlight, even despite stepping down as governor of Alaska months ago. Her influence and allure are practically unprecedented among failed vice presidential candidates. (Can anyone imagine Lloyd Bentsen, Jack Kemp or Joe Lieberman selling People magazine covers or sitting down for an hour with Oprah?) Even though she was skewered by the liberal media, lambasted by the self-loathing feminists, and slaughtered by the oh-so-cool "30 Rock" and "SNL" glitterati, Palin remains incredibly popular among conservatives. Not only that, she's got real power. President Obama's been trying to sell the country on health care reform for months, but she managed to change policy overnight with a pointed note...on Facebook. And, she's still someone people want to know about. Her book "Going Rogue: An American Life," was a best seller before it even hit the shelves. And for these very reasons, her detractors are absolutely apoplectic right now. Anyone witnessing the spin job being furiously whipped up against Palin in a desperate effort to stanch her book sales and cauterize her acclaim is in for a real treat. It is a truly acrobatic and dizzying display of agility -- but unlike the Flying Wallendas, these stunt men and women of the liberal media aren't fooling or wowing anyone. Their cheap sideshow parlor tricks are so transparent we should all demand our money back. Newsweek, in advance of Palin's book release, obviously went for subtlety. Their headline read, "How Do You Solve a Problem Like Sarah? She's bad news for the GOP -- and everybody else, too." Accompanying it was a photo of her in running shorts used in a June 2009 Runner's World spread. Newsweek's message was clear: You are not to take this woman seriously. Never mind that Runner's Week told me that the photos from that shoot are still under a one-year embargo, and that Newsweek ran the photo without Runner's World's knowledge or permission. No biggie. On "Hardball," Chris Matthews, who's still recovering from that bizarre bout of restless leg syndrome that suddenly befell him last year, actually had the audacity to say of the attention Palin is getting for her book release, "I've never seen hype like this." Apparently, the overwrought sensationalism of the Denver Democratic National Convention, where Obama stood amidst faux White House columns, under fireworks, next to Sheryl Crow and Will.i.am -- or "Hype and Change 2008" -- is but a distant memory to Matthews. In another segment, on another night, Matthews and MSNBC reporter Norah O'Donnell decided that the crowd at a Palin book signing was, well, too white. "I think there is a tribal aspect to this thing. In other words, white vs. other people," said Matthews, ever the sociology scholar. The leftwing media has long tried to ascribe a scary nativism to Palin, who best described the phenomenon during her recent Oprah interview, when she said that Katie Couric had looked at her like she was part of some kind of nomadic tribe from Alaska. Asking her what she read was like asking her if she read. Others have tried to carefully feign disinterest in the hopes that, much like the flu, disinterest is contagious. The Washington Post published a book review by Ana Marie Cox, in which she smugly "confesses" she didn't have time to read the entire book, "It's terrible, I know, but if I didn't read it all, neither can Sarah Palin claim to have completely written it." In that one sentence, we know that Cox's time constraints excuse wasn't the issue. 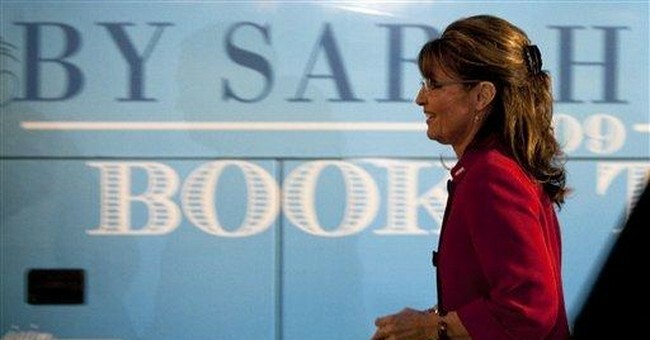 She simply wanted to be able to write in a book review that Palin's book didn't make her to-do list. Her anti-review review is fine for Cox, but what's the Washington Post's excuse for publishing it? A radio host asked me recently if the perception that she is more "human interest story than person-of-action" will harm her in the long run. The fact is, there is no one on the planet more "human interest story than person-of-action" than our current president, who penned his terribly self-satisfied autobiography at the ripe old age of 43, while a mere state legislator. But we don't see the liberal press fretting over President Obama's penchant for self-promotion. They coo when he goes on Letterman to talk about all the cool stuff that happens when you're president -- during a recession and a war. And they applaud his Nobel Peace Prize, for which he was nominated after just 12 days in office. And they rally around his embarrassing Olympic bid, which actually argued that the IOC should choose Chicago so that he and Michelle could stop and see the fam while in their old neighborhood. Obama's "me, me, me, me, me, me, me" aria is fine. But Palin's plain-speaking and honest stab at defending herself against her seething critics is schlocky showboating and shameless self-promotion. Please. Regardless of all of these tired wheezes and coughs at trying to suppress Sarah Palin, she seems totally immune in every way. She'll make a fortune on this book; she'll continue to grab headlines; and she'll remain an influential figure within the party. The liberal media just hasn't realized it yet, but when it comes to Palin, there's no such thing as bad publicity. It sure is fun to see them try, though.